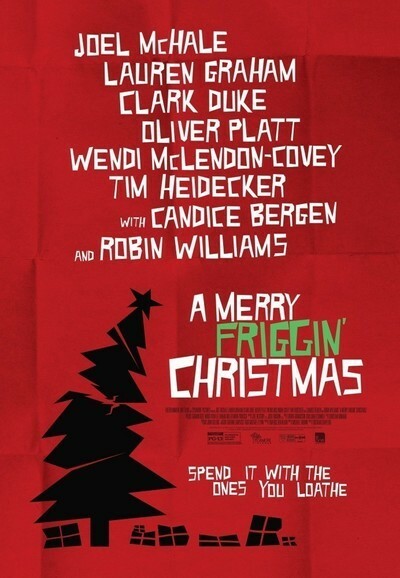 "A Merry Friggin' Christmas" is being sold as a parting gift from its late co-star, Robin Williams, but it's a better example of Williams' tendency to enliven rather slapdash films by imbuing his characters with more sincerity and soul than they might have otherwise had. Williams has a small but colorful supporting part in this Yuletide-themed comedy, which was directed by Tristam Shapeero from a screenplay by Michael Brown. He plays Mitch, the alcoholic patriarch of an extended family that he's been disappointing since the '70s. His son, a tight-sphinctered hedge fund manager named Boyd (Joel McHale of "Community"), is haunted by childhood memories of his father, a cynical, boozing crank. A recurring flashback finds drunk daddy telling little Boyd that there is no Santa, and that the Easter Bunny, the Tooth Fairy and other childhood constructs are b.s. as well. "The whole world is full of lies, boy," Mitch slurs. "The only road to heaven is to realize there's no road to heaven." As a grownup, Boyd overcompensates for his father's chaotic darkness, embracing an Ozzie-and-Harriet idea of domestic stability in a marriage to Luann (Lauren Graham of "Gilmore Girls," in a thankless reactive part), instituting a rules-and-nutrition obsessed lifestyle for his two kids Vera (Bebe Wood) and Douglas (Pierce Gagnon of "Looper"), and forsaking his childhood interest in bridge and painting for a boring but lucrative job in the financial services industry. And he's obsessed with preserving his young son's illusion that there is in fact a Santa Claus. Wacky Christmas misadventures ensue when Boyd's PTSD-suffering brother, Nelson (Clark Duke), asks him to be godfather to his new adopted baby, who's being christened on Christmas Eve. This leads to a forced family reunion in Boyd's native Wisconsin, during which we spend stressful quality time with Mitch, his long-suffering wife Donna (Candice Bergen), and Boyd's stereotypical redneck sister (Wendy McClendon-Covey) and her no-account husband (Tim Heidecker), a convicted flasher and all-around pig. The above makes "A Merry Friggin' Christmas" sound like a bleak drama, a low-key family dysfunction film along the lines of Jodie Foster's sly Thanksgiving staple "Home for the Holidays," or maybe a corrosive comedy of can-you-top-this outrageousness a la "Bad Santa." Unfortunately, what we get is a patchwork combination of all those modes, none of which manage to gel. There's a running joke involving a filthy, alcoholic, apparently homeless Santa (Oliver Platt), broad slapstick, a wacky-angry car chase, dumb jokes at the expense of immigrant Mexicans and Afghanis, and lots of scenes in which characters scream tediously expository insults at each other, presumably to bully us into thinking that their dialogue is funny. Then the film will switch gears and drop intriguing but regrettably unfocused hints that it has a deeper understanding of the human personality and wants to say something honest about it. The heart of "A Merry Friggin' Christmas" is the relationship between an alcoholic father and the now-adult children he has traumatized and let down. (One of them has erased Mitch from a family picture: patricide by PhotoShop.) The gradually unfolding flashback that haunts the adult Boyd is a metaphor of sorts. "Santa," the character, is a stand-in for our childhood illusions, or fantasies, about what life ought to be: the lies we tell each other and ourselves, and that society tells us, about what constitutes an ideal family, an ideal marriage, ideal parenting, and so forth—and that gnawing emptiness that many of us endure when reality doesn't live up to the hype. (By protecting his son's illusion that there is a Santa Claus, the hero is also protecting his son's illusion of his father as a perfect, caring, all-powerful patriarch: Father Christmas indeed.) The tension between Boyd's wish that his father apologize and reform and Mitch's inability to change—i.e., between our parents as we wish they were, and as they are—might have made for poignant, low-key, observant human comedy. But that's not possible here, thanks to all the forced, theoretically crowd-pleasing but actually tone-deaf clowning that drowns out intelligence and sincerity. There are a few nice moments of performance and filmmaking (including the elaborately choreographed final shot), but not enough to redeem a film that seems to flinch from the harsh truths it was presumably created to address.